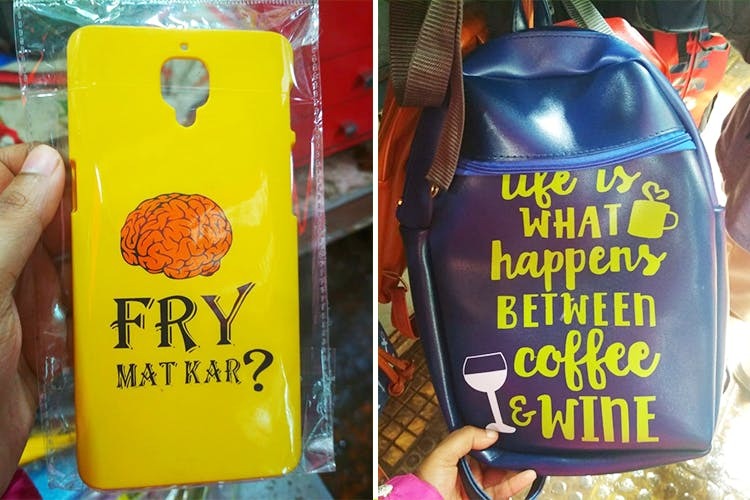 Hong Kong Lane near FC Road is a treasure trove for quirky phone covers, affordable accessories and more. We went shopping out here with INR 1,200 and managed to score 6 awesome things. Read more to find out. Up first, we picked a super-cool, navy blue backpack for INR 200 that we thought would be great for everyday use. Another cute bag that caught our attention was this hot pink, feather-printed piece for INR 300. Hong Kong Lane is best known for its wide collection of phone covers. We picked two for ourselves; one was a multi-colour Aztec case and second, was a bright yellow piece with quirky illustration. We're the biggest fans of silver, junk jewellery and Hong Kong Lane never fails to impress. We bought this very pretty, very chic lotus earrings that could easily be paired with Indo-Western outfits. Pune rains can be rough and the one thing that can make life tad simpler is a pair of good quality, anti-skid footwear. At Hong Kong Lane, the options for rubber-sole rain shoes are infinite. For us, we picked a pair of peach slip-ons with laces for INR 200. This was our last pick from Hong Kong Lane, simply because it was too cool and too stylish to let go off. Priced at INR 200, this pair of transparent Lennon glasses is one of our favourite accessories at the moment.